Bullseye is the complete family entertainment show. Three pairs of contestants from the general public, an amateur dart player the ‘thrower’ and their team partner the ’knower’ compete against each other combining their skills at throwing darts at categories on the Category Board to win money and the opportunity for their partner the ’knower’ to answer questions on that subject, and if answered correctly, win more money for the team. The ‘knower’ of each team selects a category from one of the ten categories on the category board for their partner the ‘thrower’ to throw a single dart at. Once a category has been successfully hit that category drops out of this round. Each ‘thrower’ competes in three rounds of darts against one another with the highest scoring team given the chance to convert the number of points scored into pounds by correctly answering a general knowledge question. If answered incorrectly the question is passed in turn to the second-highest and lowest scoring teams. At the end of this round the two teams of contestants with the lowest scores leave the show taking with them the amount of money they won in Round One and Round Two, plus a Bendy Bully, a Bullseye Tankard and set of Bullseye Darts. They could come back in part two if the team through to the end game decide not to gamble and take the money they won in part one and the prizes the won on ‘Bully’s Prize Board’ in part two. At the end of Round Two, the team with the highest score continues on to Part Two of Bullseye. Round Three is two-fold. A different guest professional dart player or guest celebrity on each show in the series throws three rounds of darts (three darts in each round) to try and score as many points as they can. If they score 301 or more the final score is doubled. The guest professional dart player or guest celebrity score is then converted to cash equal to the score and then sent to a charity chosen by the two final contestants. At the same time the guest professional dart player is throwing to try and get the highest score of all the professional dart players used in the series. Click here for past series Bronze Bully league tables. The two contestants now play ‘Bully’s Prize Board’. The board has eight red sections with a black section either side of each red section, plus a red Bullseye. 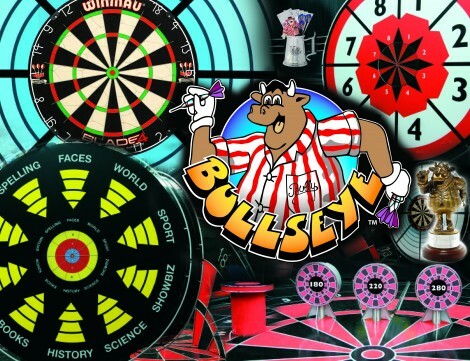 Each red section contains a terrific prize and the Red Bullseye featuring ‘Bully’s Special Prize’. The team has nine darts to try and win all nine prizes: 6 darts for the ‘thrower’ and 3 darts for the ‘knower’. Once a red section is hit, the light showing that section comes on and the contestants win whatever prize is in that section. If one of the contestants hits the same red section again, the light in that section goes out and they lose the prize in that section. Hence the well known rule ‘Keep out of black and in the red, nothing in this game for two in a bed’. The Host then offers the two contestants 1 of 2 options. The contestants now have an agonising choice of which option to go for. They can decide not to risk losing all the money and prizes they have won on the show and not gamble ‘Bully’s Mystery Star Prize’ and leave the show, taking with them all the money and prizes they have won. The contestants can risk losing all the money and prizes that they have won on the show so far by trying to win ‘Bully’s Mystery Star Prize’. To win ‘Bully’s Mystery Star Prize’ they must score 101 or more with six darts between them. They each have three darts. The ‘knower’ throws the first 3 darts followed by the ‘thrower’, who throws the final 3 darts. If they score 101 or more, they win ‘Bully’s Mystery Star Prize’, for example: a new car, a 10-day luxury Caribbean Cruise for 4 people or £20,000 cash. They also keep all of the other money and prizes they had won on the show earlier. If they failed to score 101 or more, the Host commiserates with the contestants and then says, “I have to say this, look at what you could have won, reveal ‘Bully’s Mystery Star Prize”. By failing to score 101 or more the contestants lose the lot. It’s all or nothing!